Motocom is a specialist marketing communications agency for the motorcycle industry. Founded in 2000, Motocom’s directors blended their complimentary skills and more than a lifetime’s experience of motorcycle marketing, to offer a range of communication services to manufacturers, wholesalers and dealers. Visit Motocom’s website at http://www.motocom.co.uk. The Russo-British Chamber of Commerce is a not-for-profit company, limited by guarantee that has worked to promote trade and cooperation between the UK and Russia since 1916, helping companies in both countries to find trading partners and representing the interests of its member companies of all sizes. Visit the RBCC’s website at http://www.rbcc.com. We are deeply endebted to Mark and Linda Wilsmore of the Ace Cafe London, for hosting our celebrity send off on 16th June 2011. The Ace Cafe is a world-famous landmark on the London’s North Circular Road which, over its 73-year history, has welcomed many “greats” of biking and rock n’roll as well as spawning the original “Ton-Up Boys”. Its appeal today is undiminished and we are honoured to be associated with such an icon of motorcycle history. Visit the Ace Cafe’s website at http://www.ace-cafe-london.com. Ben Portsmouth and his band, Taking Care of Elvis, present an amazing tribute to the King of Rock and Roll, with his looks, style and fantastic voice which will set hearts racing and feet tapping. The “Moskvateers” are proud to announce that Ben will be playing at the Ace Cafe London to mark their official send off on 16 June 2011. 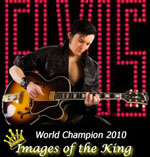 Visit Ben Portsmouth’s website at http://www.elvistribute-band.co.uk. So we don’t get lost, Plant i have kindly donated tracking equipment for all five vehicles taking part in ride. Plant i Ltd range of telematics based vehicle tracking and fleet management solutions enable you to achieve operational efficiencies and increase productivity. Through the optimisation of your fleet operation, a vehicle tracking systems will soon pay for itself and ultimately save you money. Visit Plant i’s website at http://www.plant-i.net. Hood Jeans are a British company specializing in reinforced denim motorcycle jeans – a family firm of jean manufacturers going back to the 1950’s. In 1999 the Hood brand was launched with the K7, the world’s first seamless motorcycle jean. Hood Jeans consistently beat their competitors on both price and quality. Visit Hood Jeans’ original website at http://www.hoodjeans.co.uk/ or see their new range at http://www.kyrano-uk.com/. The UK’s finest retailer of quality motorcycle brands. For over 15 years we’ve worked very hard to satisfy our customers’ needs and, as a result our efforts and sheer commitment to bikers – and the sport, at all levels – have been recognised with some very prestigious awards. We are still a independant family run business which allows us to give one to one service and backup. Visit Sound Distribution’s website at http://www.sounddistribution.co.uk. Roger Beale is a proper “Motor Mechanic”. He repairs cars, he doesn’t simply replace parts, he has a deep understanding of all the systems that in total make a motor vehicle (of any make) work. Residents of of Waltham St Lawrence can contact Roger on Tel. 9342261 and he takes credit cards. Auto Technics have spent many years improving and gaining most major manufactures’ approval which has resulted in us becoming one of Berkshire leading accident repair centres. We have gained great success through exceptional customer services and professionalism. Visit Autotechnics’ website at http://www.autotechnics.com. Our thanks to Jack Lilley Triumph, Ashford, for kindly sponsoring John a service for his trusty Tiger 1050cc. Lilley’s have been a family-run business since 1959. They are the UK’s #1 Triumph dealer. Exports available for parts and accessories. “If we haven’t got it, you don’t need it”! Visit Jack Lilley’s website at http://www.jacklilley.com/. HC Travel have kindly donated travel insurance for the team via their sister company, www.bikerstravelinsurance.co.uk. HC Travel are the UK’s leading motorcycle tour company, offering motorcycle tours and motorcycle hire on all 5 continents. Whatever your experience, whatever you want, whatever your budget, they have something for you. From riding Route 66 on a Harley, to climbing the highest pass in the Himalayas on an Enfield. Visit HC Travel’s website at www.hctravel.com. The Russia House, mentioned in John Le Carré’s novel of the same name, was set up in 1970 by Barry Martin, who is still the Managing Director of the company, leading a team with forty years experience in facilitating and providing services to foster Russo-British Trade. We are extremely grateful to them for facilitating the application process for our Russian visas and also for waiving their usual procuration fee. Visit their website at www.therussiahouse.co.uk. We are extremely grateful to Piotre Szewcow of DFDS Ferries,Northern Europe’s leading integrated shipping & transport network, who stepped in at the eleventh hour and offered us First Class return ferry tickets from Dover to Dunkerque. For full details of their routes, please visit their website at www.dfds.com. Many thanks go to Catherine Cleall Harding of Eurotunnel, who not only donated tickets for our return trip to the UK from Calais to Folkestone, but was also immensely helpful in organising a suitable rendezvous point for Prince Michael’s group. We cannot thank you enough, and are only sorry that we were unable, in the end, to take advantage of your terminal facilities. For details of Eurotunnel’s fares and timetable, visit their website at www.eurotunnel.com. SCF Group is the largest Russian shipping company offering a full range of crude oil, refined petroleum products and liquefied gas transportation services. It is one of the world’s leading tanker owners. The company actively participates in key Russian oil and gas development projects including operations in harsh ice environment, as well as successfully competes in the international maritime shipping markets. On behalf of The “Poppa” Guttmann Trust, we would like to thank SCF for their extremely generous donation. To find out more about the services they offer, please visit SCF’s website at www.sovcomflot.ru.